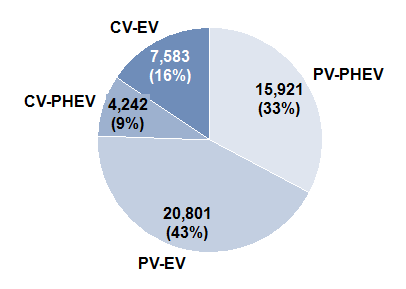 Subsidies seem to have their effect on sales of electric cars in China. Buyers of pure electric, plug-in hybrid electric, and fuel-cell electric vehicles enjoy significant incentives for their car purchase (for respective cars produced in China). Subsidies range from around 30,000 RMB for simple pure electric vehicles up to 180,000 RMB for fuel-cell electric vehicles. This significant monetary incentives led to a production of over 50,000 vehicles in China until end of May 2015. The growth trend is rapid, yet still at low level in regards to overall production. Subsidies are expected to continue as well next year in 2016, so the growth trend is unlikely to stop in the short-term.